AWeber is an email marketing software product which can help you to stay in touch with your customers and send out targeted and personalized emails easily in bulk. This is one of the most effective ways you market your business in the internet age. TopFiveAdvisor took an in-depth look at AWeber and we were very impressed with the product. AWeber is a Pennsylvania-based company in the US which was founded in 1998. The company employs 110 professionals at the time of this review, and serves a customer base of more than 120,000+ users around the globe. This is a company with ample experience which has stayed up to date with the latest email marketing innovations to provide a product which has a strong foundation and which stays ahead of the curve. 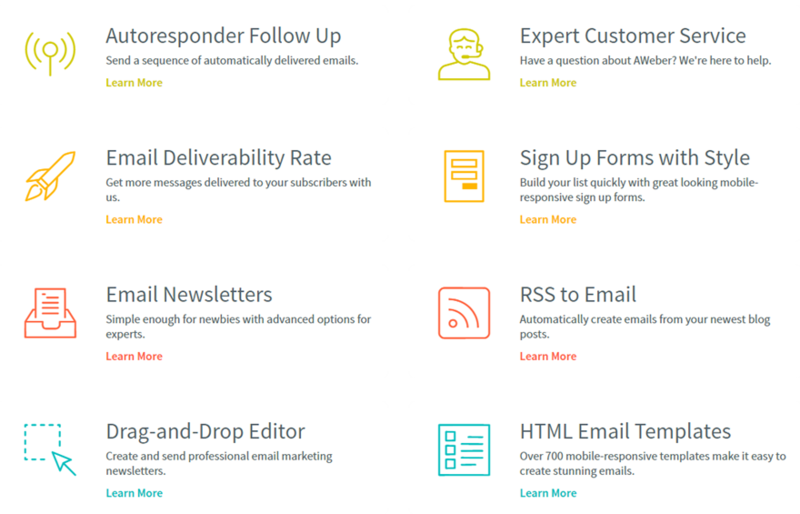 The most popular email marketing platform. Aweber is used by many of the top internet marketers. Includes powerful opt-in forms that work! A very user friendly backend that makes email marketing fun! They recently redesigned their website with a new welcoming layout and structure. They are very reliable with email delivery. TopFiveAdvisor uses Aweber! NEW: They just added a free trial. We’d love to see the ability to have option-based segmenting based on user selections (available as a premium off-site service only). AWeber has extensive email marketing software features for newsletters starting with more than 150 customizable templates. Both single and multiple column designs are available and there are also many different color schemes which you can use. It’s easy to load in your logo and any other images you’d like to display, and emails display well in all major email clients. You can fully personalize emails with information such as the names of your subscribers. Analytic information helps you to manage your email campaign, and you also can automate the process of sending out blog posts to your subscribers via email. This can save you a lot of time and hassles. Useful networking features like sharing buttons can be included in emails so that your subscribers can easily spread the word. You also can publish copies of your newsletters online in an archive so your subscribers can read past emails and non-subscribers can see the benefit of signing up for your mailing list. Subscriber management starts with getting new email newsletter subscriptions in the first place. AWeber provides an easy web form builder and provides you with one-step publishing for your site. Within minutes you can make it possible for people to sign up for your newsletter. That’s the first step, and once you’ve done that you’re ready to start spreading the word through other outlets, segmenting your campaigns, and checking out your analytics. Analytic software helps you to figure out which of your email marketing campaigns are doing the job and which ones aren’t working as well. You can see who opened your messages and who didn’t, which links were clicked on and who clicked on them, and also how many people have unsubscribed from your list as a whole. You also are shown how your emails translated into direct sales conversions. One of the most powerful email marketing tools is segmentation. With segmentation, you can send relevant, targeted emails to your subscribers based on the interests they have expressed during sign-up and their browsing and shopping behavior since then. This means that you can send out emails which are likely to convert to customers who want to receive them, and not spam customers with messages which aren’t relevant to them. You can segment your campaigns according to additional details like geographic location as well. Segmentation is so advanced these days that you can send out personalized emails to all your subscribers in bulk, automatically. Bulk email software like AWeber provides you with analytic information so that you can streamline your campaigns. The information includes graphics which are easy to read and which help you to see at a glance which tactics are working out and which ones aren’t converting. 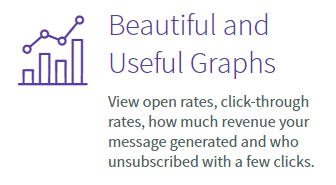 To the left of your graphs you’ll see quantitative information including directly generated sales revenue. With the information you get from the email reports, you can then work on adapting your campaigns to raise your conversions. You’ll be able to figure out which groups of people were interested in particular products or have a certain spending limit and then send out targeted emails in the future based on your discoveries. Aweber is extremely competitive with their pricing and the actual pricing structure hasn’t changes in a very long time. No bait and switch here. The pricing you see to the left is based on the base + addition model. 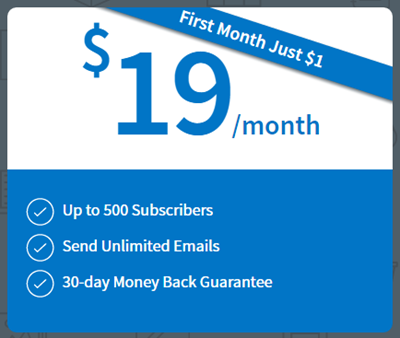 Meaning, if you subscribe monthly for $19 and have 5,000 subscribers, you’d pay $19 + 30 = $49. We know many get confused over the pricing so we hope this clears it up before considering their service. Customer support for AWeber includes a contact form which you can use for a ticketed query, along with live support via toll free phone, international phone, or live chat. Customer support is available from 8 AM to 8 PM ET Monday through Friday and 9 AM to 5 PM ET Saturday and Sunday. Along with live customer support, you’ll find access to a knowledge base you can use to hunt down answers to your questions on your own as well as video tutorials which make it easy to learn how to use the program. Free live webinars hosted by email marketing experts help you learn how to get more out of your platform. You can view a schedule for upcoming webinars on the support page of the website. We particularly love their blog! You can learn more about how to write, offering incentives, increasing your email open rates and much more without even becoming a member. AWeber is arguably the most popular email marketing platform on the web, and is used by numerous top internet marketers around the world. The software includes powerful opt-in forms that work and a user-friendly backend that makes email marketing fun. Just browsing the website you can get a feel for the simple elegance with which AWeber presents information. Pricing may be the only drawback, with the lowest pricing tier ($19.00 per month for up to 500 subscribers) being a little higher than we’ve seen elsewhere. 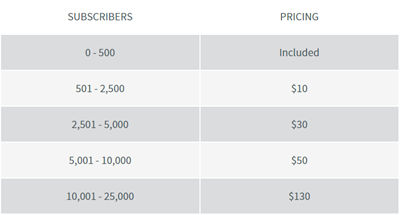 There are four other pricing tiers listed on the website, the most expensive being $149.00 per month for up to 25,000 subscribers. Additional tiers are available, though you need to contact customer service to learn more about the pricing. AWeber is a premium service at a premium price; as such, some will find their prices to be too expensive. 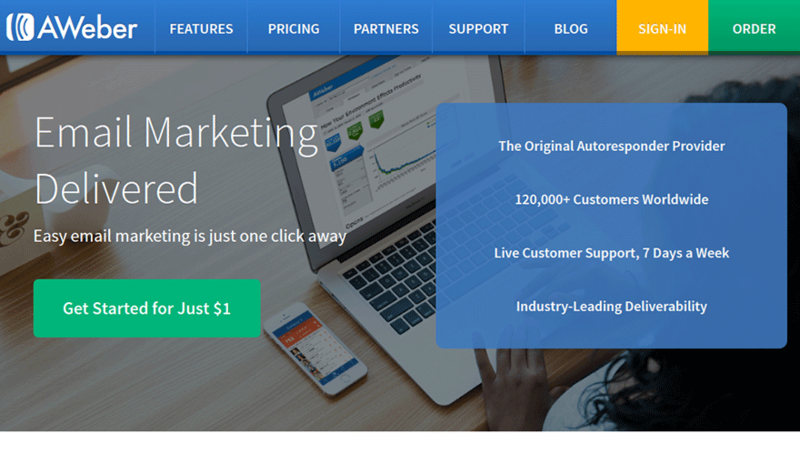 Aweber has a free trial available and there is also a 30-day full refund satisfaction guarantee. If you want the best of the best in email marketing, AWeber should be your choice. Their price may be higher than most, but they also include the best premium features. Give their free trial a run to decide for yourself. TopFiveAdvisor gives AWeber a 10/10 for a well-designed, user-friendly platform with excellent premium features.